What should we make of the erratic swings in jobless claims which recently increased by 86,000 before dropping by 50,000. Examining historic trends can often spread light on what is going on. Tim Iacono from The Mess That Greenspan Made explains what factors could be influencing the job numbers. The latest weekly jobless claims data will be released tomorrow morning and, after last week's strange report, it could offer even more interesting surprises. Recall that, last week, seasonally adjusted jobless claims dropped almost 50,000 to 522,000, the lowest level since January, a development that was in stark contrast to changes in the raw data showing an increase of more than 86,000 from the week before, all of this prompting a good deal of head scratching for those who were interested in looking beyond the headline number. To help understand just what happened, the jobless claims data going back some 20 years is shown below. Since this graphic contains so much data, there was no alternative than to create a much larger image - you'll have to click on it to make much sense of it. The first thing you notice when comparing adjusted and unadjusted jobless claims data is that this data series really does need seasonal adjustment. The most pronounced features are the January layoffs that come right after the holiday shopping season when, even in a booming economy, jobless claims double or triple at the start of every year. The other big seasonal events are the summer layoff for autoworkers that normally occur during the first two weeks in July. These can also be seen clearly in the graphic above - jobless claims spike up early in July and then they go far below the seasonally adjusted data until they get ready to spike up again the next year. The labor department tries to account for these patterns, applying seasonal adjustments to the incoming data, however, the system is not perfect, even less so during times of economic upheaval associated with recessions. But, what's really intriguing about this data is the area to the right of the chart above, an enlarged version of which is reproduced here. You can see the red and blue curves diverging dramatically over the last two weeks. The red curve, representing the seasonally adjusted claims fell from 617,000 to just 522,000 during this period while the unadjusted data rose from 559,857 to 667,534. The fact that actual claims for unemployment insurance did not spike up much higher is the reason that most have cited for why the seasonally adjusted claims plunged - layoffs earlier in the year as GM and Chrysler entered and exited bankruptcy were said to have drawn from the pool of planned layoffs over the summer. But, what's striking about this is that the downward move in seasonally adjusted claims (the plunging red curve) seems to be an extraordinary response to the rise of the unadjusted data (the blue curve). 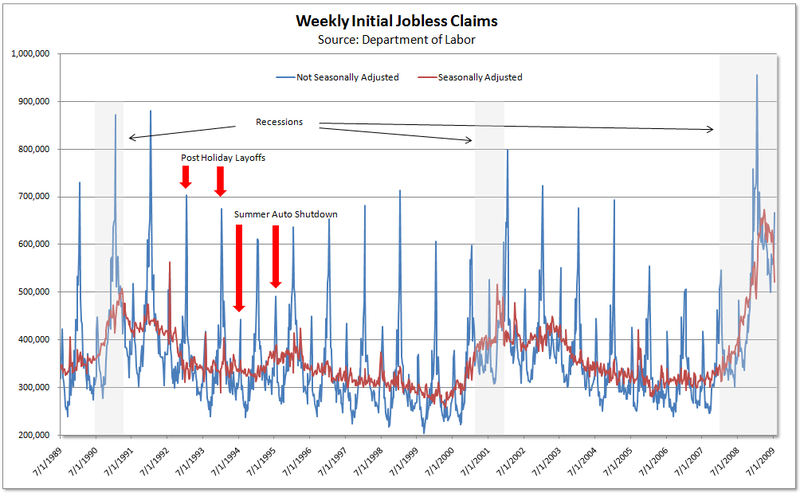 Simply looking at the relationships between the January and July surges in unadjusted jobless claims over the last twenty years shows that the relative size of the two this year is not unusual in any way but, at no other time do the seasonally adjusted claims drop so sharply during the summer. Around the year-end holidays much wilder moves are seen, even more so during recessions, but, in a data series that goes back to 1967, never has there been a bigger divergence between the adjusted and unadjusted data during any two week period of the summer and fewer auto related layoffs doesn't appear to explain this difference. The Labor Department will likely be fielding more calls about this data tomorrow.